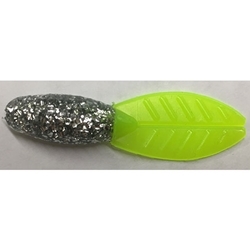 The BoneHead Tackle 2″ Brush Glider has proven to be highly effective for catching bigger crappie. Its ridged body has a non slip ribbed back which generates a better hooks set. The body also has a wide profile which makes for a highly visible target from crappie below. We can’t forget about the wonderfully versatile beaver tail that promotes a gliding or fluttering action as it falls slowly. Features: Wide body profile, Ridged body design, Versatile beaver tail, Durable soft plastic, Made in the USA, 16 to package, Great dock shooting bait.